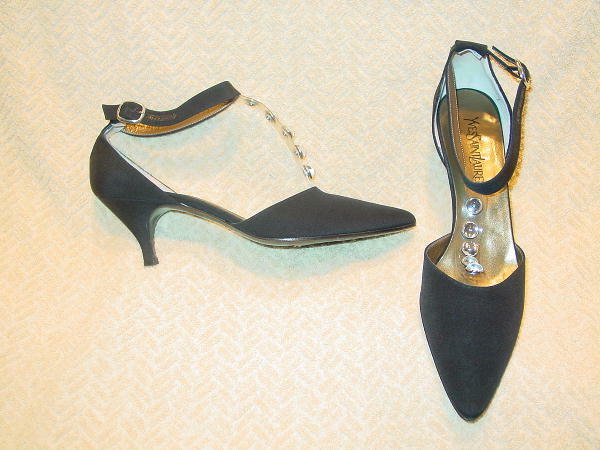 These black fabric open shank heels are by Yves St. Laurent. The very nice fabric feels like a combination of silk and peau de soie. They have ankle straps with 5 holes on a thin black leather strip and silver-tone buckles and prong. The leather linings and insoles are a bronze color. Extending downward from the outer side of the ankle strap to the vamp is a 3/4" wide by 4 1/4" long clear plastic strip with 5 silver-tone clear faux jewels. They're from a stylist's inventory, and were worn in a runway show and a magazine photo shoot.